Great job! Looks perfect for holding a ball of yarn. I love it! First time- Really? You did a great job. Color is pretty too. 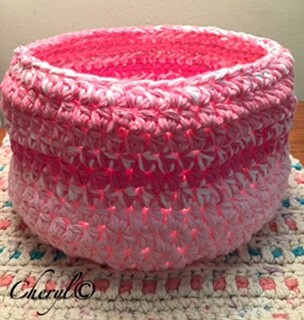 Beautiful....I have always wanted to make baskets but never got around to it. Cheryl, me too and I am going to make another in a different shape. I got a book crochet baskets in walmart by the cotton yarn and this basket was in there and it was easy to make.